WPJobBoard is translated like any other WordPress plugin using *.po/*.mo files, you can use desktop software like POEdit to translate and compilee files, however this is overly complicated and since version 4.0, we recommend using Loco Translate plugin on your WordPress site instead. 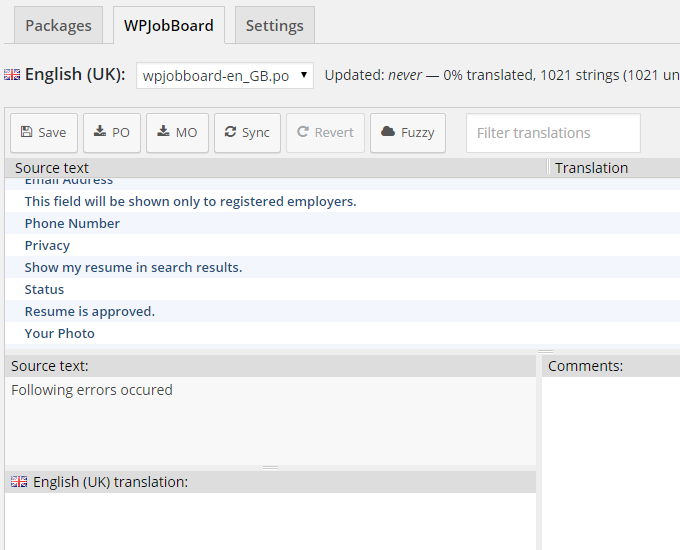 The plugin allows to translate WPJobBoard from wp-admin interface and see translation results live. 1. The first step is going to your site wp-admin / Plugins / Add New panel, in the search box (top right) search for “Loco Translate” and install it. 2. Once you have the plugin installed and activated go to wp-admin / Loco Translate / Manage Translationspanel, scroll down to Adverts and click “New Language” button next to it (see screenshot below). 3. In new panel select your language and click Start Translating button. Once you are done remember to click “Save” this will generate .mo file. Notice the “Sync” button above, this is a tool you can use after upgrading to latest Adverts version (the chances are new version will have some new phrases or some old phrases customized). The Sync will re-scan Adverts source and show phrases you need to translate if any. In case you would like to do a manual translation (using some software like POEdit), then you will find WPJobBoard translation file in wpjobboard/languages directory (wpjobboard.pot file). After successful translation save your files in wpjobboard/languages directory as wpjobboard-xx_XX.po and wpjobboard-xx_XX.mo, of course replace xx_XX with your actual locale (for example de_DE, fr_FR). 1. I translated phrases using Codestyling but the phrases still show in English? Please make sure that you have WPLANG constant defined in your wp-config.php file, for more information please see WordPress In Your Language article in WordPress Codex. 2. I am using Codestyling plugin, but the list of phrases to translate is empty? After adding your language, you need to click Rescan button so CS plugin can collect all the phrases first. 3. I am seeing some kind of error messages on top? These are probably just a warnings, if you still can translate phrases then you should just ignore them. How do I change the currency from USD to GBP £? Hi, to change the currency in the pricing just go to wp-admin / Settings (WPJB) / Pricing panel, edit the selected pricing and change its currency.